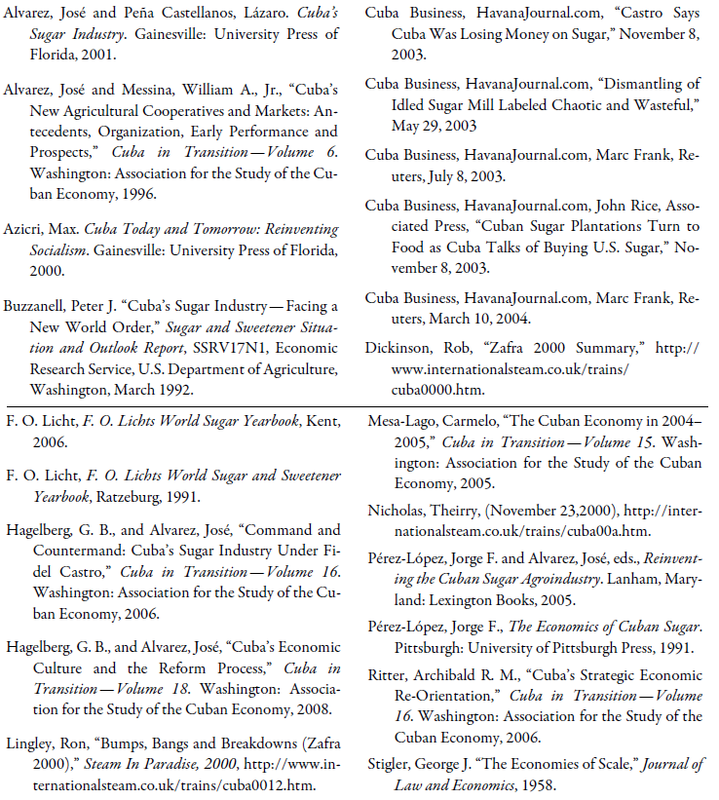 Economic Logic in Cuba’s 2002 Sugar Industry Restructuring? When Cuba’s government officially announced in 2002 that 71 of its 156 sugar mills would be closed permanently, one of the strong media themes was that Cuba had suddenly taken a big, surprise step away from sugar production. In reality, that step had been taken long before 2002, as Cuba’s sugar manufacturing capacity had been effectively shrinking for many years. Nowhere was that pre-2002 shrinkage more apparent than on the popular “rail fan” tours to see “working steam” throughout Cuba. As a legacy of chronic net disinvestment in cane transportation over half a century, Cuba had the world’s greatest number of antique steam engines working to supply cane to the mills in each zafra. Rail fans from around the world, shunning what they disparagingly labeled “circus steam,” were drawn in notable numbers to Cuba’s annual display of “working steam.” They were among the first to notice, in the late 1990s, that MINAZ had effectively shut down dozens of factories. Among the researchers who also noticed the rolling mill “outages” were Kirk and Alvarez and Peña Castellanos who noted that “… the 1999–2000 harvest used just 111 of the 155 sugar mills available, since others were not economically viable” and that “the 1997–98 season started with about 116 mills, that is, about 40 mills taken out of production for efficiency and cost considerations” (Kirk [Foreword], Alvarez and Peña Castellanos, 2001, pp. xii and 102). Alvarez and Peña Castellanos further noted that “neither the names of the CAIs [complejos agro-industriales] closed, … nor the methodology used for taking that decision were officially announced” (Alvarez and Peña Castellanos, 2001, p. 102). Although the methodology for the closings would remain a mystery, by the late 1990s the Ministry of the Sugar Industry (MINAZ) was providing the names of closed mills to tour operators, and by the 2000s these lists were published routinely on the Internet, sometimes with planned starting and ending dates for individual mills. By as early as November of year 2000, Cuba steam tourists had noticed that about 45 of the mills seemed to be more likely to be on lists of closed mills (or absent from the lists of open mills) than other mills. Although the mill closings noticed by researchers of the Cuban economy appeared to be rolling “outages,” by the late 1990s a pattern was emerging. Those mills that kept re-appearing as not open were a large percentage of the mills that would be officially announced as permanently closed in the summer of 2002. Thus, many of them were already closed, de facto. Combining the information embedded in rail tourists’ annual postings from 1999 to 2002 with analysis of the patterns of the official mill closings announced in 2002, coupled with what has been written about the factory closings, offers a rich insight into Cuba’s predicament and provides some reasons why few of the stated objectives of the mill closings have been accomplished. WHAT DID RAIL FANS SEE AND WHY DID MINAZ LET THEM SEE IT? Historically, MINAZ has treated operational information on its sugar industry as semi-secret information to be protected. However, by the late 1990s, there wasn’t much left to protect. Years of disinvestment in every key element of sugar production—from land preparation, planting, cultivation, herbicide application, harvest planning, transportation, grinding, processing, energy extraction from bagasse, machine maintenance, to production of sugar and byproducts—had left the Cuban sugar industry in a severely impaired state. By the late 1990s it was clear that Cuba could earn a greater return from tourism than from sugar production. One comparative advantage that Cuba had was the large number of antique, decrepit steam engines working to haul cane in each zafra. Thus, a small but considerable tourism niche market developed in charters to see working steam engines in Cuba. MINAZ’s scruples about releasing information had to give way to the rail tourists’ need for timely information on which mills would be open and which would be closed each year. Charter operators developed “… special rights with MINAZ” to “coordinate all official visits to the sugar mills on the island” (Rob Dickinson, Zafra 2000). Without timely information on which mills would be closed, the value of a Cuba rail steam vacation would have been greatly diminished. Since “beginning in the mid-1990s the Cuban government adopted a policy of temporarily shutting down some forty-five mills during the harvest season, spreading the pain of economic idleness across the country” (Pérez-López and Alvarez, 2005, p. 145), tour managers not knowing which mills were closed would stand to lose future re-bookings. Although it is true that “the decision by the Cuban government, in April 2002, that about half of Cuba’s 156 sugar mills would be closed permanently took most analysts by surprise” (Pérez-López and Alvarez, 2005, p. 146), evidence from the rail fan sites indicates that the decision was made long before April of 2002. By studying MINAZ’s lists of closed and open mills published by rail fan Web sites, it is possible to determine that it is likely that the decision to close most of the mills announced as closed in mid-2002 was actually made at the latest in November of 2000. Table 1 summarizes the raw data contained in the “Steam in Cuba” website lists of closed mills and displays the numbers of the mills either listed as open or closed that would eventually be on the list of mills closed in the summer of 2002. The list rail tour operators had for Zafra-2000 showed 52 mills open where steam railroad work might be observed. Of those 52 open mills, 27 would close permanently in 2002, indicating that a decision had not yet been made on which mills to permanently close. However, in the fall of 2000, MINAZ provided tour operators with a list of 51 closed mills, of which 45 would be announced as permanently closed eighteen months later. The list was published by Thierry Nicholas (Nicholas, November 23, 2000) to help rail tour operators avoid dead spots for working rail steam. With perfect hindsight, knowing that 88% of the mills on the November 2000 list of closed mills would be announced as permanently closed in the summer of 2002, makes it likely that for many of the mills, the death sentence was decided sometime before November 2000. As support for that interpretation, only 6 of the mills listed as closed on the November 23, 2000, list subsequently show up on the open list for Zafra- 2002. Examining the distribution of mill closings by mill size gives one indication of the extent to which economic logic drove the decisions on which mills to close. Although internationally, raw sugar factories were tending toward larger capacities, indicating a belief among sugar managers and technicians that there were net economies of larger sizes, the 2002 announced reconstruction did not as radically alter the distribution of mill sizes as might be expected. Some large mills were shut down and many small mills were not shut down. 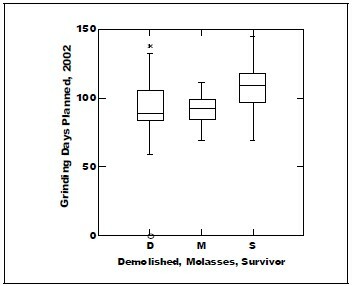 Figure 1 shows that the median size of the mills kept open was somewhat higher than the median size of those closed (the center line of each box plot). 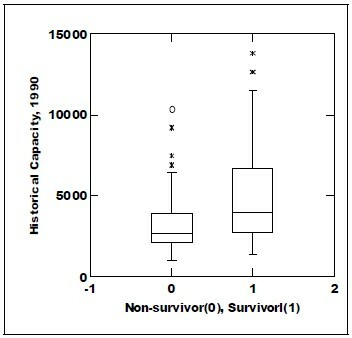 Moreover, Figure 1 shows that over 75% of the mills kept open had capacities greater than the bottom 50% of mills shut down (non-survivors = 0; survivors =1, with the tops and bottoms of each box being 75th and 25th percentiles). On the surface that looks like the pattern of mill closings was designed to utilize perceived economies of greater size. However, the wide dispersion of the sizes shut down in Cuba does not show the concentration of closings in the smaller sizes that would be expected from the market-driven mill closings observed in other countries in recent years. In part, that may be due to the fact that many smaller mills are producing sugar at a lower unit cost than the larger mills as a result of inadequate inputs to support efficient production at the larger mills. Whether or not there were any true economies of size in Cuba in 2002, Figure 1 does show that the Cuban authorities who made the shutdown decisions, thought there were. Figures 2 and 3 show that although the overall positively skewed distribution of mill sizes was preserved in the retrenchment of 2002, the reductions in numbers of mills were biased toward the mills under the 6,000 ton size. Since sugar factories are essentially continuous process chemical plants, which operate most efficiently near rated capacity, that bias toward closing smaller mills most likely had the effect of making the industry less viable. In a resource poor environment, larger mills lose their comparative efficiency advantage over smaller mills within normal ranges of plant capacities as larger mills encounter logistical complexities that are more difficult to resolve. George Stigler’s survivorship method can reveal economic logic in a process where many operating units do not survive. In a market economy the survival and non-survival attributes have to do with allocative efficiencies and inefficiencies associated with specific sizes. 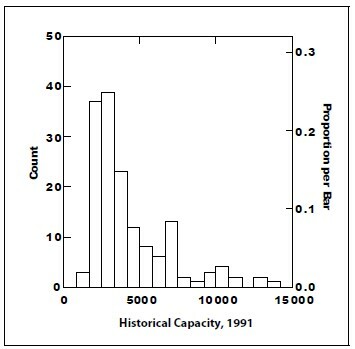 When Stigler’s methodology is applied to the changes in the number of mills by size class for 1990 and 2004 (before and after restructuring), it becomes clear that the Cuban authorities viewed 6,000 tons of daily input capacity to be the minimum efficient size (MES). Table 2 shows that the size class beginning with 5,928 tons is the first size class that does not show a precipitous drop in the number of mills between 1990 and 2004. In the rest of the world MES is indicated by the first size class with a strong, sustained increase in the number of mills. However, MINAZ’s closing of mills with one large, sweeping, central decision, causes the researcher to look for a size class without a sharp drop to detect the threshold of efficiency perceived by policy-makers. That size class is 5,928 to 7,503. Cuba’s Stiglerian MES can be compared to the minimum efficient sizes of mills in the United States and Australia over the same time period to see how much in step Cuba’s restructuring was with world sugar industry trends. 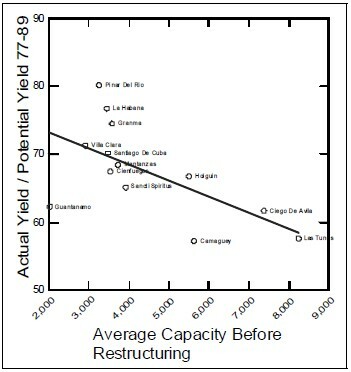 Tables 3 and 4 indicate how survivorship in the Cuban restructuring experience compared to the more market-driven survivorship processes in other countries not constrained by the paucity of resources characteristic of the Cuban sugar industry. The survivorship table constructed for the USA cane sugar sector shows a minimum efficient scale of about 10,000 tons, as indicated by the first size class with an increase in the number of mills being the 10,001– 14,000 ton size class. As with the USA MES, Australia’s MES was about 10,000 tons using the same survivorship criterion (the first size class to show a significant increase in the number of mills. Of course, the extreme and sustained disinvestment in Cuba’s sugar sector from 1990 to 2004 meant that Cuban sugar managers were not free to choose an optimal size of an agro-industrial sugar unit. For example, the factory Urbano Noris has been the incredible shrinking factory, down from a peak historical capacity of 12,650 tons to its present estimated capacity of 4,000 tons. Such shrinkage of capacity can only come with extreme spare parts shortages that require factories with three sets of mills to run only one line, as other production lines are cannibalized for spare parts to maintain production and to trade with other mills for other inputs. Application of Stigler’s survivorship technique clearly shows the extent to which Cuba has fallen behind by not being able to produce sugar at the most efficient scale of operations. Although it would be tempting to conclude that Cuba would have been better off closing more of its smallest mills and leaving the larger mills that were closed open, given the chronic disinvestment that accelerated in Cuba after 1989, neither large nor small mills could be reliably operated on a basis of world standards of efficiency. Table 2 is the result of perceived returns to size by Cuban decision-makers, while the USA and Australia results shown in Tables 3 and 4 show a market driven pattern of survivorship. Given the extreme shortages of key inputs in the Cuban sugar industry it is likely that the MES derived from the size pattern of restructuring overestimates the MES in Cuba as it was in 2002. On the other hand, given the world-wide trend toward larger mills, MINAZ’s de facto selection of a relatively small factory size for Minimum Efficient Size (revealed in the survivorship analysis), suggests that the decision on which mills to close may not have been driven primarily by economic logic. Disaggregating the restructuring by province gives more indications that MINAZ’s decisions of which mills to close went beyond economics. 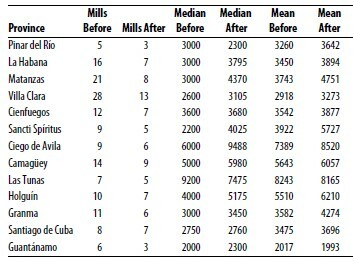 Table 5 shows that in spite of the large numbers of mills closed in Cuba and a bias toward closing smaller mills, the average sizes of mills retained was not that different from the average sizes of mills before restructuring in most provinces. Only in Matanzas, Sancti Spíritus, and Ciego de Avila did both the median and mean mill sizes grow by more than 1000 tons in the 2002 restructuring. In all the rest, the mean and/or median mill size either grew by a small amount or shrank. It is difficult to understand how a sweeping centralized decision to close over 70 factories would improve efficiency if the size of factories surviving did not significantly alter mill sizes in most provinces. WHAT WERE THE OBJECTIVES OF THE MILL CLOSINGS? Pérez-López and Alvarez (2005, p. 146) quote Fernández Font, a Cuban economist (from year 2000), as saying: “a restructuring of the industry is required … that places greater importance on efficiency, costs, and profits over the strictly quantitative output targets pursued under the earlier model.” That was echoed by Sugar Minister Rosales del Toro, who stated at the announcement of the restructuring that the objectives were “higher efficiency, lower costs, [and] higher profitability.” Features of MINAZ’s short-run plan for restructuring (1997–2002) and long-run plan (2002– 2010) included: increasing cane yields per hectare, greater factory sugar recovery rates, lower unit production costs, increased co-generation of electricity, increased number of byproducts and sugar derivatives, change in product mix to higher value sucro chemicals, greater specialization by concentrating sugar derivative production at limited number of mills, internationally competitive costs of production, and greater food production (Pérez-López and Alvarez, 2005, p. 146). Cuba Business (July 8, 2003) reported that the hope of the restructuring was to get output per hectare up by 30 to 40%, while cutting production by 25%, reducing grinding days to 90, and getting capacity factors above 80% at 71 out of 85 mills (71 producing raw sugar and 14 producing molasses). As Cuba Business noted, the 2003 zafra was a 180 day season, with capacity factors at 79 mills “well below 70%,” and with low yields per hectare (Cuba Business, July 8, 2003). Fidel Castro also put a happy face on the disaster that was the 2003 harvest: “imagine how much we would save cutting a smaller quantity of sugar cane. I’d prefer to cut a million and a half (tons) than 2 million because with that million and a half we could have a reasonable profit” (HavanaJournal.com, Nov. 8, 2003). Obviously, the hoped for greater efficiency that would allow production to rise to around 4 million tons from fewer sugar mills did not happen, nor was a “million and a half (tons)” a happy outcome. 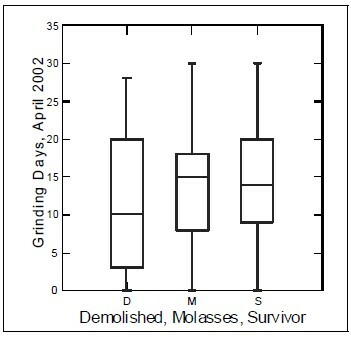 Figure 4 shows the grinding days of the mills still operating in 2002 in three categories: the ones that would be de-activated, those that would only make molasses, and those that would survive to make raw sugar after restructuring. 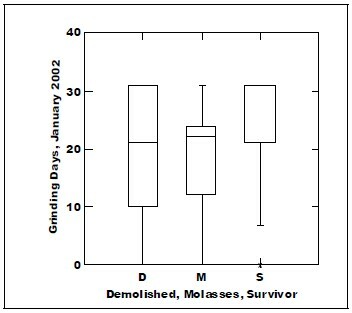 The molasses mills had a very tight pattern, with the middle 50% of mills operating between about 80 and 100 days. The destined-to-be-non-survivors that were not already closed had a wide range of operating days, as if there was a push to process all the cane possible. The non-survivors-to-be that were still operating, were given a plan that had a significant number of them grinding for less than ninety days. Figure 5 shows that over fifty percent of the mills that would be designated by MINAZ as survivors, and that appeared on the rail fan lists, had planned grinding of 31 days in January. That wasn’t accomplished. Figure 6 shows that MINAZ’s plan for the mills to be announced later in the year as deactivated, was a wide range of grinding days from mill to mill in April of 2002. While the survivors and the molasses mills had a planned median around 15 days and their 25th and 75th percentiles were between 10 and 20 days, the wouldbe- de-activated mills that were still operating, had plans from MINAZ to go from zero to about 28 days. WHY DIDN’T THE RESTRUCTURING WORK? One of the vestiges of centrally planned economies is a presumption that economies of larger size must always be positive in feasible ranges of production. Unfortunately, although there is no denying that economies of size exist, utilizing those economies is conditional on other resource requirements. Essential to capturing economies of larger-sized operating units is that the rated capacity of the central processing factory must be realistic. Historical capacity is of no use in determining how much cane can be processed in a 24–hour day if the true capacity is 20% of the capacity that the mill had at its zenith. Reported capacities in Cuba have been fictional (but based on historical capacity) for most of the last 35 years. Fictional capacity of the processing unit that all cane must pass through is a huge disadvantage in an industry that depends on close synchronization of cane planting, cutting, cultivating, transportation and processing. 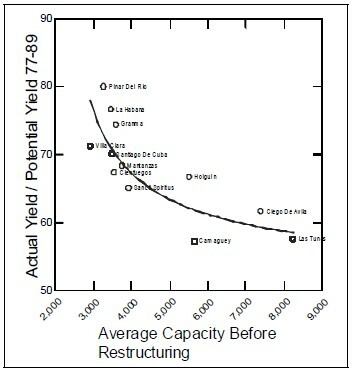 With roughly 120 days of sensible processing available, an unknown processing capability guarantees large amounts of lost time (a lower capacity factor), guarantees that immature and stale cane will be ground, guarantees that the cutting and transportation operations will pulsate instead of flowing smoothly, all of which guarantee that unit costs will be higher. Whatever the true capacity of the plant, if it is unknown, the plant will oscillate between operating at full capacity for several hours to operating at various sub-optimal operating levels for most hours of the day after the harvest begins. For many hours the plant will be producing nothing. Beyond the problem of rated capacity there is also the problem of misunderstanding that in a resource poor environment, resource bottlenecks can occur anywhere in the system. The bottleneck may be lack of cane of a required maturity, insufficient numbers of trucks, trains, carts or draft animals, lack of knowledge of what cane of what quality is where, or lack of cooperation from the growers to schedule mill deliveries in the most efficient manner. That becomes an economies of size issue when central decision-makers do not understand that bottlenecks anywhere in the system reduce the optimum size of a processing unit. Larger mills have more cane in the transportation system, traveling farther than do small mills. Smaller mills are able to more easily utilize inter-mill hauling (because they are closer to more adjacent mills) and do not have as much cane trapped in the system when bottlenecks appear. The economies of scale and size observed in other countries depend on balanced investment in all stages of production. That simply has not happened in revolutionary Cuba. Simply closing more small than large mills to capture economies of scale would not be expected to work and it did not work, even to the limited extent that it was tried in the restructuring. Cuba has been disinvesting from its sugar sector for many years.2 There was no commitment of resources behind the 2002 restructuring, hence, depreciation was the driving force behind the negative net investment that accelerated after restructuring was announced. For many surviving sugar mills in Cuba the only investment was zero-sum cannibalization of physical capital, either from its own production lines or from a nearby mill. Doing “back-of-the-envelope” calculations on the rate of negative investment in Cuba’s sugar sector during “the Special Period,” the implicit annual rate of negative net investment must have been on the order of 7%. As Ritter (2006, p. 149) noted, “… sugar continued as a ‘cash cow’ slowly being pushed into the ground.” Considering the tiny amount of investment in the sector, the drop in sugar production prior to and after restructuring is not surprising. No matter how decrepit and small were the mills closed in the restructuring, their deactivation made official the negative investment implied by the rolling shutdowns before restructuring. 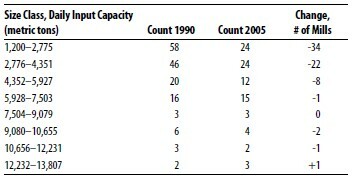 Comparing the aggregated provincial published capacities from F. O. Licht’s World Sugar Yearbooks for 1991 and 2006, it is clear that Cuba’s reported production capacity dropped by about 234,000 tons of daily grinding capacity, to 64% of former capacity nationwide. With that much reported capacity shed, it was unrealistic for anyone to think that production could have increased to four million tons after 2002. Beyond the broad based cuts in capacity, there were haphazard aspects of the restructuring that created many reports of waste. In some areas cane not to be used to make sugar was burned to make way for tilling for food crops that would not be planted. Understandably, some Cubans asked “why couldn’t that have been used for cattle feed?” Others asked, “as hungry and needy as we are here in Santa Cruz del Norte … they should have sold cane juice” (Cuba Business, May 23, 2003). And why wasn’t the land replanted with food crops? Allocations of seed didn’t get everywhere. Moreover, there were many reports of the capital needed disappearing before the task could be started. A typical report was that plowing on the reallocated land wasn’t done because “there is no fuel for tractors.” “…The tractors themselves were taken away by order of the administration and no one knows where they are now” (HavanaJournal.com, May 29, 2003). Without knowledge, rumors spread among newly unemployed mill workers that “the machinery from the sugar mill was bought by Venezuela to be used as spare parts” (HavanaJournal.com, May 29, 2003). There continue to be reports of much land that had been in sugarcane going fallow. The Basic Units of Cooperative Production (UBPCs), established in 1993, represented another central decision from Havana that was supposed to improve the sugar sector. Insufficiently appreciated by decisionmakers was that they had radically increased the complexity of the sugar harvest. A successful sugar harvest depends on close coordination between what is happening in the fields and what is happening in the factory. Before the establishment of the UBPCs, a mill manager was dealing with an average of 5 state farms. After the establishment of the UBPCs, a mill manager was coordinating operations with about 11 UBPCs. In Las Tunas, the average mill management went from dealing with 10 state farms to dealing with 28 UBPCs. Although before the revolution, individual mills were supplied efficiently by numerous “colonos,” this was achieved with the mill management having strong central authority on how much cane would be transported to the mill from where, and when. Mill managers do not seem to have that kind of influence with the UBPC managers. The result is complexity that grows with the size of the mill. Considering the creation of the UBPCs in 1993 and the mill size drift of the announced restructuring in 2002 clearly calls into question the economic logic behind those decisions. Perhaps if we had more information, the wisdom of those decisions could be perceived. The problem is that when actual yield as a percent of potential yield for each province is regressed against provincial average state farm sizes, no statistically significant relationship is found between average size of state farm and efficiency (pre-“Special Period”). So what decision was made? It was decided to make the UBPCs radically smaller than the size of the state farms (43% of the size). On the one hand, it could be argued that without statistical significance there are no economies of scale to give up with the downsizing. On the other hand, shrinking the size risked triggering diseconomies of small size that would show up at the factory. Figures 7 and 8 make it clear that larger mills tended to be associated with lower yields, especially when Guantánamo is excluded. Based on that experience, what decision did MINAZ make on the mills in the late 1990s and early 2000s? The decision was to make the mills larger (though not radically larger). Larger mills make sense in an industry with preferential prices protected by import quotas and with stable supplies of state-ofthe- art capital inputs. They do not make as much sense in a resource poor environment where there is an inverse relationship between mill size and yield. Definitive conclusions on the economic logic behind the restructuring will have to be deferred until independent scholars have access to industry and to mill archives and access to former sugar mill managers and MINAZ officials. Enough information is available to indicate that there was not a great deal of economic logic behind the decision to close many of the mills closed. There was an intent to improve efficiency by closing high cost mills, but it is doubtful that industrial cost accounting at the mill level reflected true unit costs in a way that could provide a basis for knowing which were the high cost mills. As Ritter (2006) has observed, the prices paid to the UBPCs were fictional, and as Alvarez and Hagelberg (2008, p. 303) have observed, much of the data that is reported at more aggregated levels, oscillates between “spurious precision” and gross rounding, implying made-up numbers. It appears that MINAZ centrally decided which mills to close without good numbers on unit costs at the mill level. Another finding is that the decision to close the mills was most likely made before 2002, when it was announced. Rolling mill outages were already well established before 2002.4 There is some evidence that the decision was made as early as the fall of year 2000. One can speculate as to why it was not announced until mid-2002. 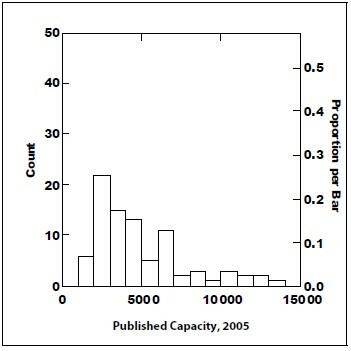 Survivorship analysis revealed that the distribution of closed mills by capacity did not radically change the average size of the sugar mills, although it did eliminate some of the smallest mills. Survivorship analysis also shows that minimum optimal size of a mill in Cuba, factoring in the impact of restructuring, is smaller than the minimum optimal size of mills in richer sugar producing countries. This may be because the extremely austere resource constraints at the mill level are felt more at the larger mills than at the smaller mills. Although Cuban government announcements of mills that lead in efficiency often highlight a small mill like Carlos Baliño in Villa Clara, the pattern of mill closings does not show that as a driving force. Although the fact that many small mills were kept open may indicate that MINAZ understood the advantages of small mills in a resource poor environment, the acrossthe- board way the restructuring was imposed makes it appear to have been driven more by political logic than by economic logic. Although some restructuring was necessary, the disparity between stated objectives and actual outcomes means that restructuring did not enhance economic efficiency in the sugar sector. The way restructuring was done made it more of a formal recognition of a collapse of an industry that had already imploded, than it was a new policy to increase efficiency. 1. Consider the experience of U.S. state university systems under a strong Chancellor with great centralized power. Much like Che Guevara’s empresa consolidada system, decision-makers in Harrisburg or Tallahassee sometimes go too far in mandating policies that impair the operating efficiencies of the operating universities. 2. The International Steam pages for Zafra-2000 had many reports of distant cane fields being de-linked from the mills even to the point of a mill pulling up “the tracks at its most distant LPs [Loading Points].” The Z-2000 reports showed that “most mills were operating at least one month behind schedule” and that “even when mills were experiencing breakdowns, and this year that was reported to more than usual, there was not usually a large buildup of cane waiting to be processed.” Beyond that, “many mills [were] not working.” The picture that emerges is that Cuba’s sugar production sector had already imploded. 3. “The Mal Tiempo circus plays on, your first picture is free and then the train stops and negotiations begin. What an appropriate name for a mill ….” The point here is not that train crews living under a regime of economic austerity seek to make a few extra dollars. It is that in the middle of a sugar harvest, negotiating for picture rights has precedence over cane deliveries. 4. The trend toward mill shutdowns has continued. Mesa-Lago (2005) noted in 2005 that only about 45 mills were operating and that mills that were out of service were not being repaired. Meanwhile, Ritter (2006) noted in 2006 that only about 30 mills were operating.